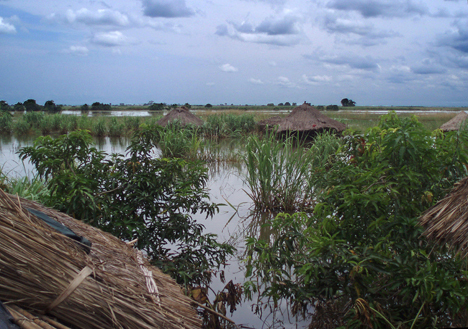 Torrential rains cause the Zambezi River in Zimbabwe to overflow its banks in 2008. Africa University graduate student Donwell Dube examined how water governance can minimize water-related disease outbreaks. A UMNS file photo by the Rev. Jacob Jenhuro. When cholera struck Harare, Zimbabwe, during the past year, one of the worst-affected areas was the high-density suburb of Budiriro. Donwell Dube, 39, a graduate student at United Methodist-related Africa University, wanted to study how effective humanitarian aid was in the response to the cholera outbreak and chose Budiriro as a case study. What he discovered was that critical water governance issues must be resolved to remove the threat of water-related disease outbreaks. Dube was one of several Africa University graduate students focused on documenting community experiences with conflict and disease in hopes of informing policy making and improving the lives of ordinary citizens. Research was conducted through the university’s Institute of Peace, Leadership and Governance and in the Faculty of Health Sciences. According to the World Health Organization, Zimbabwe had 83,631 reported cases of cholera and 3,879 deaths from the disease since February. Of the total number of cholera cases reported nationally, 68 percent originated from Harare, Manicaland, Mashonaland West and Masvingo provinces, largely because of inadequate access to water and sanitation. In his findings, Dube noted that the intervention of nongovernmental organizations in the Budiriro crisis was not enough to solve the community’s water problem. With a population about 200,000 people, Budiriro was constructed after Zimbabwe gained independence in 1980 and is found on the periphery of the water and sewage system of the City of Harare. The suburb also has no reservoir and is located at a high altitude, making water provision difficult because Harare’s water supply system is gravity-driven. Health also is an issue at Zimbabwe’s largest maximum-security facilities. Roy Tapera, who received a master’s degree in public health, collected data at Chikurubi Prison in Harare and Khami Prison in the second-largest city, Bulawayo. Before pursuing graduate studies, Tapera was a health promotions officer for the Matabeleland region under the Zimbabwe Prison Service. The lack of proper diet has led to “deficiency diseases, such as pellagra, and an increase in opportunistic infections and communicable diseases,” he said. A positive development, however, was the involvement of humanitarian organizations, including the Red Cross, in the provision of supplies to inmates. 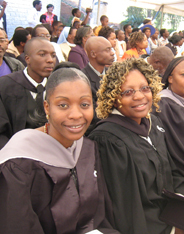 Two students who received their master’s degrees in peace and governance in June, 26-year-old Congolese national Beatrice Musambu and Linnet Mutungura, a 36-year-old Zimbabwean, looked at women’s participation in peace building and government. In a case study of the Kalemie, a district of about 3,000 in eastern Democratic Republic of Congo, Musamba examined the role of women in peace building processes in the highly volatile Great Lakes region. Musambu’s findings point to success stories in the demobilization of child soldiers and rehabilitation of people affected by the war; and with the life skills training programs in farming, market gardening and basic literacy that were initiated. However, she also found that women, who comprise 53 percent of the population, were still largely marginalized and excluded from rehabilitation and self-empowerment programs. In addition, she noted that between 1998 and 2004, some 25,000 cases of sexual violence against women were reported. She has recommended that the Congolese government and civil society work together to strengthen policies on women’s proportional representation and better educational opportunities for girls and women. Gender policies also were a factor as Mutungura focused on the traditional leadership system in Zimbabwe, using Sarupinda village, about 12 miles from Mutare, as her case study. The village has a population of about 6,000, with women constituting the majority. The few respondents who were not happy with women’s exclusion wanted laws to promote women’s involvement. Mutungura advocates programs to sensitize the current leaders and the communities they serve on the importance of women’s inclusion in government. Solomon Mungure, 41, a graduate student in Institute of Peace, Leadership and Governance, investigated the dynamics of conflict and illegal diamond dealing in Chiadzwa, about 37 miles south of Mutare in eastern Zimbabwe. 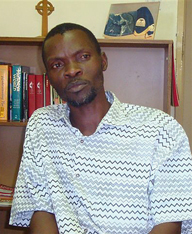 In his dissertation, Mungure cited the changes in the economic and social environment—hyperinflation, high unemployment and persistent drought—and argued that these pressures pushed people to begin looting diamonds in Chiadzwa. One result was an increase in conflict, ranging from those within local families to those in global trading markets. The illegal diamond trade involves Zimbabweans and dealers from Lebanon, Mozambique and Sierra Leone. Those panning for diamonds “were killing each other rampantly, in gruesome ways, with hoes and spades for possession of the precious mineral,” he said. The panners also broke laws, violated sacred traditions and were responsible for the increase in social ills such as prostitution and illicit drug dealing. Government statistics indicate that at the height of the diamond rush, there were about 35,000 diamond dealers living in panner bases in Chiadzwa and more than 500 dealer syndicates operating in the area. The World Federation of Diamond Bourses has banned Chiadzwa diamonds from world markets. *Stevens is director of information and public affairs at Africa University.